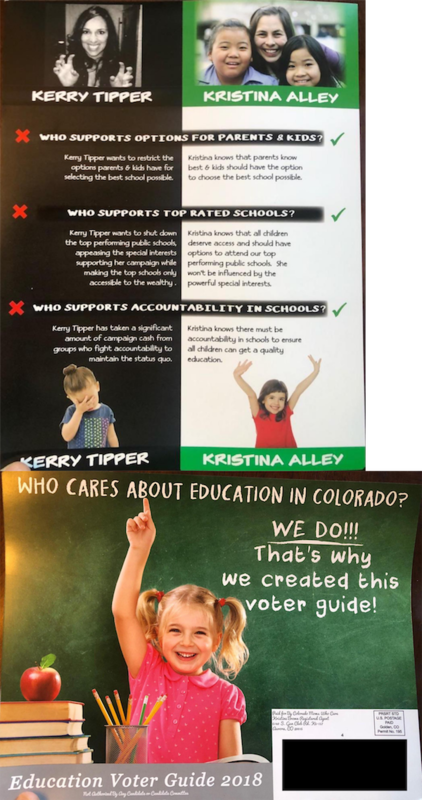 This mailer from conservative super PAC Colorado Moms Who Care differentiate Republican Kristina Alley from Democratic opponent Kerry Tipper in House District 28, an open seat in Jefferson County. While it tries to paint a scary picture of Tipper, the group cites not sources for its claims. About the messenger: Colorado Moms Who Care is a super PAC supporting candidates "who stand for family values." It is operated by Kristine Brown, an attorney focused on "sanctity of life issues." She was the co-sponsor of a failed 2008 "personhood" amendment in Colorado. The messenger's money: The group received $66,000 from Values First Colorado, another super PAC Brown is affiliated with. That group's money comes from the oil and gas industry and business interests such as PhARMA Colorado. Values First shares an address with Rearden Strategic, a company affiliated with Joe Neville, son of GOP Sen. Tim Neville and brother of House Minority Leader Patrick Neville.